It is through the medium of the arts that people of different nations and backgrounds are able to communicate and understand each other better. The West is becoming more familiar with Indian music – it is no longer merely an exotic expression of the East, but is reaching an ever growing and more knowledgeable and appreciative audience. The music of India and its history are too complex to be described briefly. Nevertheless a brief introduction will help those who are new to Indian music; they will no doubt be more influenced by what they hear than by what they read but a foreknowledge of certain theoretical points may assist their appreciation. Indian music has a very long, unbroken tradition – the accumulated heritage of centuries. The origin can be traced back to Vedic days – nearly two thousand years. The culture of India today is an outcome of the interaction and interweaving of races and cultures, both indigenous and foreign; and it is the study of the contribution of these various races and tribes that gives us the picture of the evolution of Indian music. The Negrito, the Mongoloid, the Dravidian, and the Aryan, have all contributed to the complexity of Indian culture. North Indian music is popularly known as Hindustani music and South Indian as Carnatic; their origin is the same, only the approach and style are different. When and how the two main schools crytallized would be an interesting study but the earliest treatises of Indian music do not make any distinction between Northern and Southern schools. One of the strongest and most significant influences has perhaps been that of Islam (and of Persian music); a few centuries of Muslim invasion and rule brought in its wake a changed perspective in the style of Northern Indian music, rather than in its structure. Not being part of the religious ritual it was necessarily fostered outside the places of worship; hence an element of physical pleasure, particularly of the courtier, became predominant. It is interesting to note the influence of Indian music on sculpture and particularly painting. Painters have portrayed the theme of the Raga and they have named their paintings after the Ragas and Raginis. Both paintings and sculpture concentrate on creating contained, volume-filled forms. Great care is taken to keep the basis simple. The moving line and contained space complement each other, giving each other meaning. This is exactly analogous to the character of Indian musical melody, which moves in smooth united motions, including within its curves definite units of musical form. The tradition of Indian music should be understood in the context of Indian life and thought. The theory and practice of Indian music are the logical result of a consistent development, a distinctive process, which plays an integral part in Indian history and culture. One should not listen to Indian music and judge it in terms of Western music or any other musical form. It would be like judging Beethoven or Brahms in terms of Raga (the basis of Indian melody) and Tala (the basis of Indian rhythm). Ideally, the western listener is requested to forget counterpoint, harmony, and mixed tone colors and to relax into the rhythmic and melodic patterns of a great cultural heritage. Each melodic structure of Raga has something akin to a distinct personality subject to a prevailing mood. Early Indian writers on music carried this idea further and endowed the Ragas with the status of minor divinities, with names derived from various sources, often indicating the origin or associations of the individual Ragas. In theoretical works on music each Raga was described in a short verse formula, which enabled the artiest to visualize its essential personality during meditation prior to the performance. 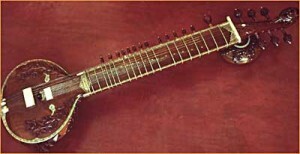 This borrowing of the meditational technique used in Hindu worship enabled the musician to enter into the mood of a particular Raga and thus perform is successfully. Raga is neither a scale, nor a mode. It is, however, a scientific, precise, subtle, and aesthetic melodic form with its own peculiar ascending and descending movement which consists of either a full octave, or a series of six or five notes. An omission of a jarring or dissonant note, or an emphasis on a particular note, or the slide from one note to another, and the use of microtones along with other subtleties, distinguish one Raga from the other. There are 72 ‘melas’, or parent scales, on which Ragas are based. Raga has its own principal mood such as tranquility, devotion, eroticism, loneliness, pathos, heroism, etc. In Indian music there is above all an awareness between man and nature, each acting and reacting on the other, and hence each Raga is associated, according to its mood, with a particular time of the day, night or a season. Improvisation is an essential feature of Indian music, depending upon the imagination and the creativity of an artist; a great artist can communicate and instill in his listener the mood of the Raga. 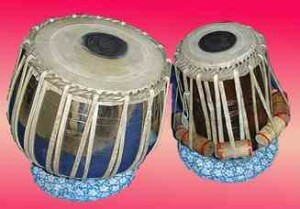 ‘Tala’ is the second important factor in Indian music. These are rhythmic cycles ranging from 3 to 108 beats. The division in a Tala and the stress on the first beat, called ‘Sum’, are the most important features of these cycles. Talas having the same number of beats may have a stress on different beats, e.g. a bar of 10 beats may be divided as: 2-3-2-3, or 3-3-4, or 3-4-3. Within the framework of the fixed beats the drummer can improvise to the same extent as the principal artists after going their separate ways, come back together with an accent or stress on the first beat. Thus, the ‘Sum’ becomes the most important beat of emphasis throughout a recital of Indian music, since this urge for unity and its fulfillment are the most rewarding experience.